February 22nd, 2010 – Cairo, Egypt – The hustle and bustle of 16 million people is drowned out five times a day by the stereophonic musical chanting of the many mosques in Cairo. To Westerners, the excessive use of the car horn and complete disregard for any sort of lane markings or direction is a bit overwhelming. Mix in the people playing Frogger and its extraordinary that more ambulance sirens are not heard. “You must have eight eyes to drive here,” Dr. Ashraf Marei says smiling as he drives calmly amidst the hoard of automobiles and pedestrians with only his arms. He is a board member of the Egyptian Paralympic Committee, a professor of adapted physical education at Helwan University, and a paraplegic. 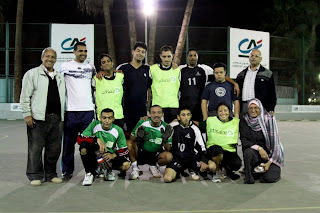 He has arranged for us to visit their program at the Cairo Sporting Club. Situated on an island in the Nile, it seems to be removed from the noise of the city despite being in the middle of Cairo. 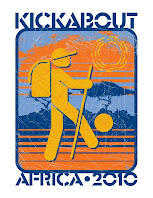 While the normal membership fee is 75,000 Egyptian Pounds (around $15,000 USD), both the physically and intellectually disabled children in the program are given free access to this club five days a week for activities that range from swimming, basketball, volleyball, tennis, and athletics to camping, music, art, and of course…football. Ms. Shadia Kamal is responsible for the 50 children including her son, ages five to twenty-two, who show up here at Cairo Sporting Club. The program started in 1993 and the first group of intellectually disabled children in the program has been developing together for over 15 years. We have the privilege of playing football with many of this group, who are now around 21 years of age. It is dependent on volunteers, many of whom have children in the program. The Egyptian Paralympic Committee’s aim is to give the children some independence and increase their ability to develop both physically and mentally through exercise. The boys run through a series of drills that improve their passing, dribbling, and shooting. I jump into the warm-up jog and stretch remembering how achy I was after our last little kickabout with the kids in Wadi Rum. My partner is Ahmed, Ms. Shadia’s son. As we pass and dribble, I note how proficient everyone is and, although their reactions are not quick, their technique is excellent. At the end, Eli and I join in for a big 5 v 5 game. The game is supposed to end at 6 p.m., but our game is getting intense as the score quickly jumps to 2-0. Eli and I gather our team together and although we don’t speak Arabic and they don’t speak English, it is clear that the five of us are on the same page…we have to get back into this game. We respond to make it 2-1…then they score again, 3-1…4-1…4-2. There is no possible way we are stopping until some external force tells us kids that it’s getting dark and it’s time to go home for dinner. Finally, at 6:45 p.m. someone calls the game as the parents have been waiting for over half an hour. We lost 5-3 but it was a wonderful game among old and new friends. We gather for a quick photo and they start singing a chant that we don’t understand, but that we recognize as something in celebration of a great evening of football. Ms. Shadia is all smiles as Ashley, Eli, and I thank her profusely for allowing us to share the day with the boys. She tells that one of the boys couldn’t walk when he first came to Cairo Sporting Club. It is a testament to the way this program has allowed this group to develop as all of the boys were able to run, kick, change direction, dribble, and of course perfectly execute a goal celebration. 4 comments: on "Egyptian Paralympic Committee"
Wow amazing! 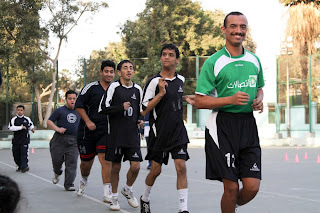 It's great to see different parts of the world embrace all types of people through soccer!